Hi Mable: We hope you and your family had a nice summer – we check the website often and can see that you have been busy welcoming lots of new kings/queens/kittens to your cattery! We have had a wonderful summer too with our new addition to the family – Gypsy! I thought we would send along some photos so you can see her – she seems to look a lot like Hans and also has the pretty cream coloring of Maggie too in her face, and on her front/hind areas of her paws. We have noticed the past few weeks that she is darkening up a bit in a few spots on her back. 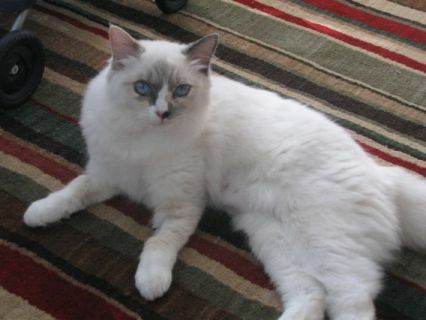 We of course think she is quite stunning and we get lots of compliment on her from friends and even our veterinarian staff – her unique coloring and beautiful blue eyes make her quite the original looking beauty. As for her demeanor, well she is just a sweetheart and all that we hoped for in a pet kitten. Like her mom, she is a total purring machine (its amazing how loud a sound she can make!) and she loves for you to rub her ears. And thank goodness, she seems to have little issue with the girls constantly picking her up and carrying her, so she is incredibly good natured which was what I had hoped for when we picked the ragdoll breed. We have only had Gypsy a few months, and even though we never had a cat and pretty much though we were a “dogs only” family before, we are totally in love with her and can’t imagine home without without her. Thank you again for our beautiful Gypsy girl! Website, all content, photos Copyright © 2005-2019.